Phineas and Ferb is one of my all time favorite Disney cartoons. I catch myself watching it even when Lexi's not around. Here's a run down of the show if you're not familiar: Phineas and Ferb basically have a permanent summer vacation, a kids dream, right?! Their annoyance of a big sister, Candace, is always trying to get them in trouble. And little do they know that their pet platypus, Perry, doubles as a special agent. They go on all sorts of adventures, while learning an abundance of knowledge along the way. We wanted to do this board to remind us that summer vacation (or at least warm weather) is right around the corner (wishful thinking, right?). For the party, focus your decor on orange, green, and blue. You can do pom poms or paper lanterns. Here's a link to a website that sells the lanterns for $1.49 a piecehttp://weddingshop.theknot.com/paper-lantern.aspx (Some are even on special for $.99, so get them while you can). Paper Lanterns - Hang purple, green, yellow, orange paper lanterns from trees or ceiling to give a festive atmosphere to the party. Perry Twinkies - These Perry treats are so cute, and they are made from Twinkies!! This is a really great tutorial on how to make them. Pez Dispensers - such a cute party favor, and easy to do too!! Jello Treats - All kids love Jello and it's easy to make, love the layer look of these and the striped paper straw is the perfect accent!! Agent P Sandwich - These sandwiches are so great!! You can use them for school lunches too. There are lots more ideas for Phineas and Ferb lunches on this site. Cupcake Wrappers & Toppers - Everybody loves cupcakes!! These topper and wrappers are the perfect accessory to the perfect snack. Popcorn Cones - These cones make the perfect portable container for popcorn, pretzel, chips!! They are easy to make too, just use papers that coordinate with your theme. Pizza - Just like Phineas and Ferb all kids love pizza, don't bother making the mess of homemade. Save money by looking for coupons or you can't beat Little Caesar's $5.00 Hot 'N Ready for parties! Phineas and Ferb Invitation - There are so many great invitations to choose from on Etsy, and it's always great to have personalized invites! 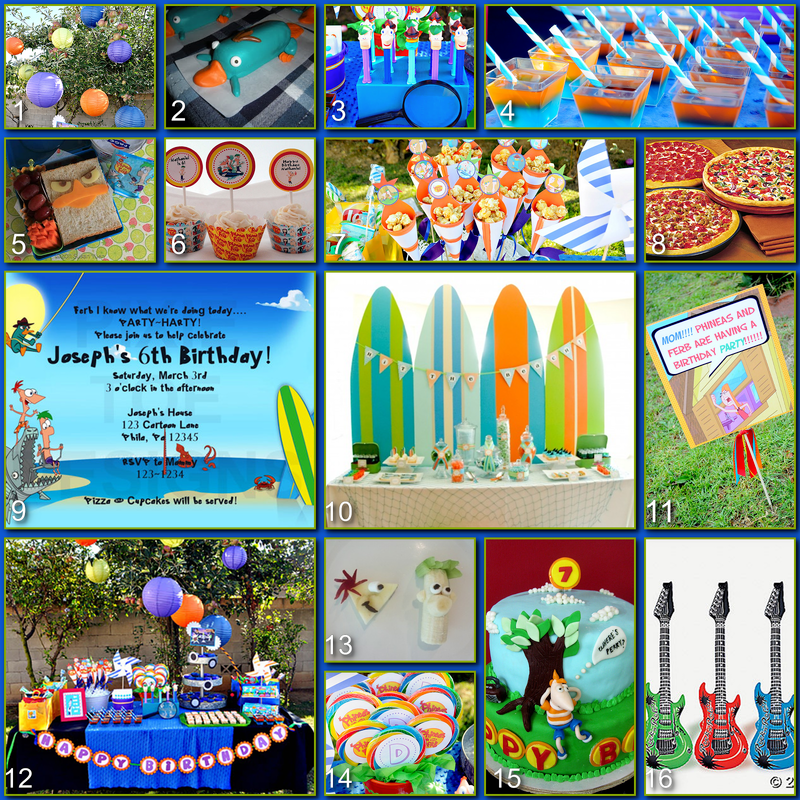 Surfboard Background - If you happen to have surfboards they are great party decor for this party. I love the idea of using them as a background for the food table. Yard Sign - I love the addition of the Tattle-Tale sign in the yard!! Phineas and Ferb fruit - It's always a great idea to offer the kids a healthy snack alternative. These are so cute they are irresistible!! Lollipops - Another great party favor for the kids to take home, and they are simple to do using downloaded printables you can find on Etsy!! Birthday Cake - Cakes have come a long way since I was a kid!! This is just one of the many great cake design we found, it was hard to choose a favorite. "Air" Guitars - Have an air guitar contest using these great inflatable guitars! Have everyone "play" the Phineas and Ferb Rock Anthem!! Honestly, how fun would this party be for kids of all ages!! Hope you enjoyed this week's party board. 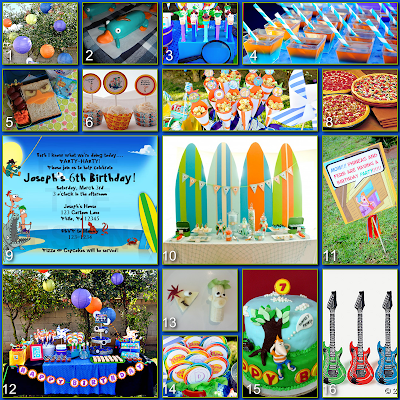 Remember to let us know if you ever use any of our party ideas for your "real" party. We would love to see pictures!! We love Phineas & Ferb! This is such a fun idea! Thanks Jodi! I think it's one of those party themes that can work for any age. Beautiful - I especially like the surfboard backdrop! I TOTALLY thought about doing that perry cake... and chickened out and paid for the premade decor kit from the grocery store! My goal for 2014 is to start making more of the items for the party boards. I am going to take my first cake decorating class in January.